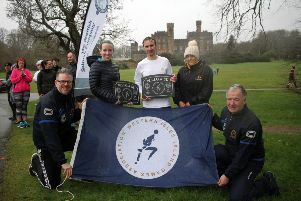 Stornoway Running and Athletics club celebrated the completion of the first year of a three year club sponsorship with E-car Hebrides. E-CAR hebrides are Club sponsors and their backing has gone a long way towards helping with the costs of the mainland travel, for junior competition events. Head Coach Seumas Mactagart said: “It’s essential for our youngsters to be able to compete in the key mainland competitions. “It allows us as coaches to gauge how all their hard work and their regular weekly training sessions is helping with their personal development. “Competing against the top athletes in Scotland is a serious part of their development as athletes and the ongoing support from e-car Hebrides helps us with the associated costs that Island clubs have to bear to allow them to compete with the best. “SRAC are grateful to E-car Hebrides for this sponsorship, and are always eager to attract additional club sponsors. 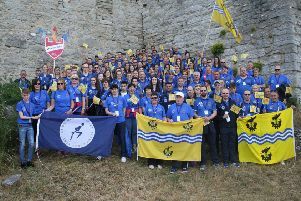 Seumas explains how the SRAC colours are very well traveled and can be seen throughout the UK and even abroad, competing in a variety of events.